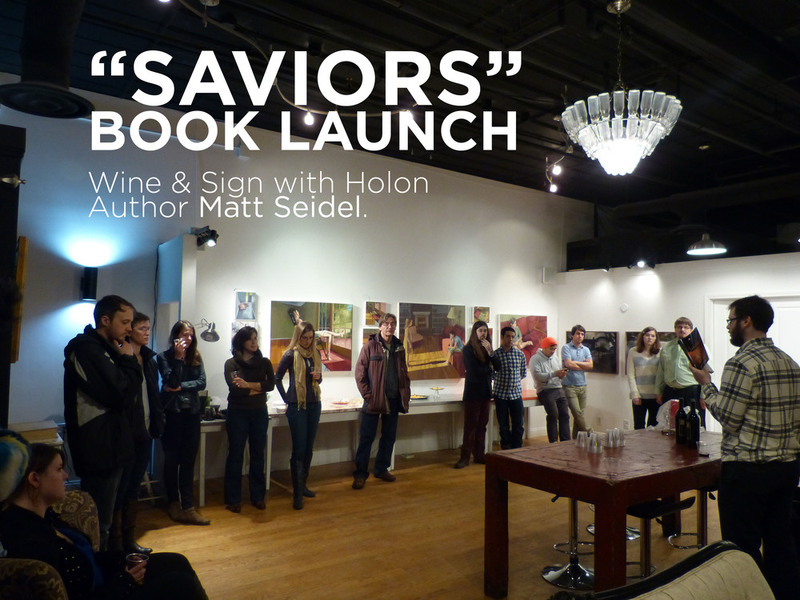 Holon Author Matt Seidel reads from his novel "Saviors" at "Wine & Sign" Book Launch, at Blueline Creative Co-Op & Art Studio. The event featured free wine tastings, snacks, a surprise acoustic guitar performance by the author and copies available for purchase. Siedel also read a passage from his book, and later signed sold copies to attendants. The book’s plot follows the protagonist Emily, an unhappy 20-something caught in the middle of a quarter life crisis – that is, until she meets Tobias, a serial killer convinced his mother was part of a cult and is called to deliver a spiritual mission. Tobias is just the antidote to Emily’s insecurity, and the two bring out in each other qualities they never expected to find. The character-driven novel’s Kickstarter campaign raised a total of $2100 and is backed by almost 60 contributors. Seidel, who teaches at Ivy Tech Bloomington and received his master’s degree in English from the University of Chicago, said he wanted to explore people’s capacity for empathy after he witnessed a Dunkin Donuts owner in Chicago kick out a homeless man of his store. Want to know more about the book? Visit the Kickstarter campaign website or follow Matt Siedel on Twitter. For information on how to get published by Holon, email holon@holonpublishing.com or call 812-269-6390.